One day during Edo period, a Buddhist priest named Junshin was in a small accessories shop at the foot of Harimaya bridge with strained look. He wanted to buy a present for his girl friend Ouma. He had been hanging around the shop for a long time so he was become the focus of public attention. At that time, there is a regulation that priests mustn’t fall in love with someone, so it was very weird that a priest was even in the accessories shop. Then suddenly he entered the shop again like he determined something and gripped one kanzashi (a long ornamental hairpin ; Japanese women had used it to have their hair dressed in traditional style,) and bought it while hanging his head shyly. When he came out the shop, his face was full of delight and satisfaction. This is a stanza of yosakoi-bushi, a traditional folk song from Kochi. This is a kind of parody and the melody of Yosakoi-bushi comes from one of kiyari (木遣り) -bushi : a song for the construction workers. They had sung as shout encouragement while carrying some big trees and rocks. During the construction of Kochi castle, this Kiyari-bushi was sung by people in Kochi. Then one day, a person saw Junshin buy a kanzashi and he felt that his action was very strange so started to sing what he saw to the melody of Kiyari-bushi. And gradually this song spread around and has come down people in Kochi until now. This is an origin of Yosakoi-bushi. 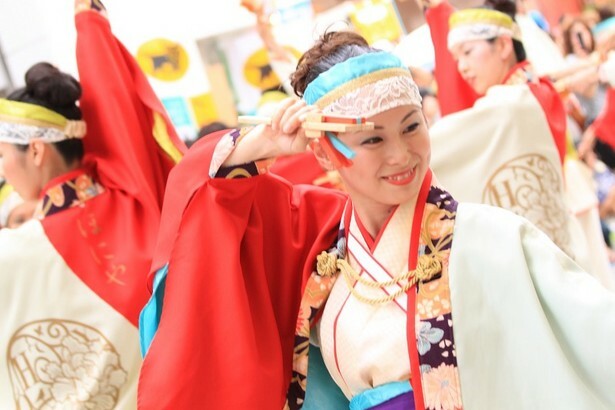 Most people can imagine Yosakoi Festival easily when they hear the word “Yosakoi”. It is a very big and energetic and powerful event in Kochi, held on August 9 to 12 every summer and on 9, very beautiful fireworks are displayed. It started in 1954 to dispell melancholy mood of a recession and encourage people. And the highlight of this festival is Yosakoi-dance. It’s a form of Bon Odori dancing and people dance with Yosakoi-bushi and naruko, a wooden clapper. The festival always accepts experimentation with music and dance, for example rock music, hip hop dance, gorgeous hairstyle and costume and so on. Each team has its own originality and ardour so we spectators never get bored. But there is a rule the basic tune of ‘Yosakoi-bushi’ be used in one form or another. After all, Yosakoi Festival has been developed as an original culture in Kochi and introduced other sensitivities and different values freely. And all of this has been brought up by the place “Kochi” which can accept a new and different world. 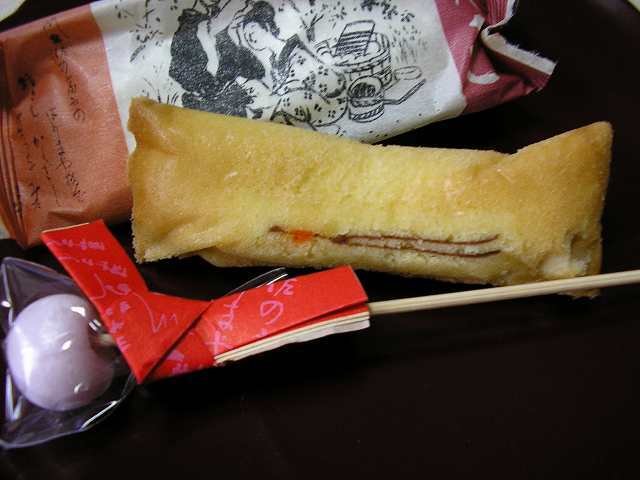 There is a sweet ‘kanzashi’ which is named after the lyrics of Yosakoi-bushi. Hamakou ( the long-established company which runs the sweets shop, real estate and the hotel ) started to sell it in 1962 and it is always nominated as one of the recommended souvenirs in Kochi and now about 4million is made and sold in a year. It uses yuzu, a kind of citrus fruits and the special product in Kochi to express the bittersweet feeling of Junshin and Ouma’s love. The Yosakoi foundation is the thing that nothing can take the place of and filled with love for Kochi. Now Yosakoi-bushi is a basis of many present cultures and traditions in Kochi and so people have it in their own hearts, senses of value and the way of thinking. So this is the reason why Yosakoi-bushi is loved by people in Kochi. Yosakoi-bushi has been loved for many many years and Junshin and Ouma’s love story has been loved, too. Unfortunately however, this love story didn’t have a happy ending. The rumor about them spread through the city due to Yosakoi-bushi and Junshin decided to elope with her. But immediately two were caught by the pursuers and punished because they broke the social rules. Junshin was banished from the country and Ouma was exiled to a far-off to east and the lovers never met again. This story is very very sad but beautiful story. People in Kochi have a warm-hearted feeling and sincerity which can feel the beauty of this tragic story. And Yosakoi-bushi would not have been popular if its birthplace were not in here Kochi. At first, I just wanted to write the article about a sweet, kanzashi, but gradually I’m sure that I feel closer to the essence of culture and tradition through Yosakoi-Bushi. It is very life in Kochi! It could come to Kochi with such histories, and it turned out that it was very good. Wow! That’s a sad love story. 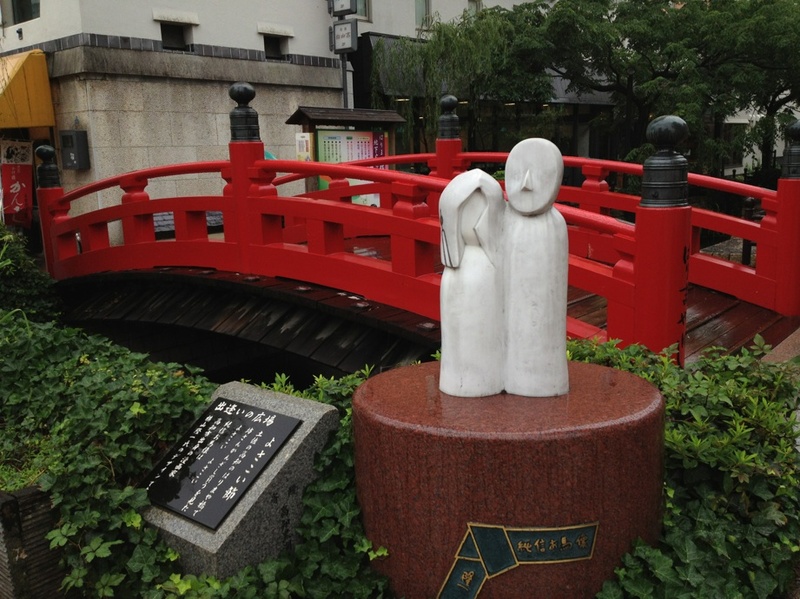 It’s nice to get to know Kochi’s yosakoi history. I never know that the red bridge had such a lovely sad story behind it. Really changed my view about it. I knew the Yosakoi-Bushi, but I didn’t know the story of Ouma. Also, I like Hamako’s Kanzashi, but I didn’t know why is name Kanzashi. What a wonderful and beatiful article is!! I was soooo moved. 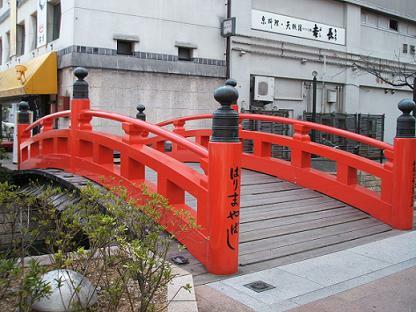 I didn’t know about Harimaya-bridge, yosakoi or Kanzashi. But you taught me about that. Kanzashi is a really beautiful sweet fanous in Kochi. But I know the history of it for the first time! It is so moving! !